Rou Gui Oolong Tea or wu-long tea originates from Mount Wuyi in Northern Fujian of China. 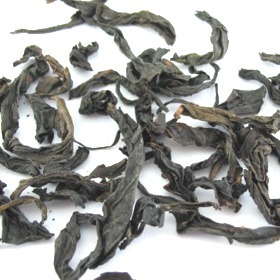 Rou Gui Oolong Tea is also known as Cassia Bark Oolong Tea. Cassia Bark Oolong Tea tea leaves is picked with special care by only choosing the best leaves. Our Rou Gui Oolong Tea is organically grown. Rou Gui Oolong Tea has a smoother and distinctive cinnamonic aroma. A good and afforable Cassia Bark Wu Yi Rock Oolong tea. One sip will sure make you fall in love with our Cassia Bark Oolong Tea. This fresh 2007 rougui wu long tea is also available in metal canister for aging purposes. Air tight canister. Available in 2 sizes 200 grams and 25 grams of rougui wu long tea. Smells a bit like cinnamon. The smell is strongly cassia with a bit of orchid, honey, and with a slight buttery fragrance. Can be used for multiple infusions. The tea should be very clear with a light orange color. Dark and slightly curled tea leaves. We recommend using purple clay or porcelain tea ware. Rinse tea cup and teapot with hot water. Use about 2 - 3 grams (approx 1/10 oz) of tea leaves (1-2 teaspoons) for every 225ml of water. Steep tea leaves in hot water at 95°c (203°F) for 1-2 minutes for the first and second brewing. Gradually increase steeping time for subsequent brewing. I love this tea. It is an extremely accessible, delicious tasting rou gui with good durability: you can get at least 5 delicious brews, but I usually go for seven or eight. The roast is perfectly blended and takes a wonderful backseat to the cassia and spice, accompanied by a lovely sweetness. Definitely a tea to re-order. This is simply wonderful. I can see why they said it has a cinnamon aroma, it was my first thought and my gfs as well, but I actually think it smells more like cherry pipe tobacco (heavy on the cherry, but with a great woody and moist quality). The texture of this tea is almost like a fine hard wood, and the flavor is a shifting one. This is one of my favorites, and one that I will save for quiet moments and special occassions. one of the best rou gui oolong I ever had. The 2005 has become the rou gui by which I judge all others. The flavor is very robust, clear, and well balanced. Its not as mature as the aged, but it is the "quintessential" rou gui, in my opinion. The cassia bark flavor is very clearly defined. This is one of my favorite teas, I cant recommend it enough. The 2007 is surprisingly good for such a young yancha. The rou gui characteristics are very accessible and not overwhelmed by roast like most this aged, even if the flavors are still a bit wild and untamed. It could use some age, but thats my preference. If you want a young rou gui, this is one of the best Ive had. Ridiculously expensive for a tea that does not live up to its description; no cassia taste, nothing to offer except for maybe its antioxidant. Smooth somewhat spicy, cinnimon flavor. Excellent as a late afternoon tea. A great alternative to your normal oolong. A nice, smooth brew that is pleasant enough, but I noticed only an extremely faint cassia aroma and did not detect any actual cassia taste.